The home of Tonia Handy and her three young daughters is packed up inside a storage unit. A shopping cart full of books. A cherry wood futon. Two garbage bags of summer clothes. Two boxes of shoes. Three pairs of roller blades. Three bicycles. Handy's sturdy dresses, the kind she claims will never fall apart and could be worn by her great-granddaughters some day. A pretty, green dining room table. For almost a year, they have been homeless in Brooklyn, N.Y., after being evicted for late rent payments. They lost so much in the last year, but a track team stepped in to help them make strides toward a more promising future. Can Art Briles, like some have done, revive his blemished career? Rarely does a coach entangled in controversy simply give in.Art Briles is facing the sort of accusation that can end a coaching career: that he was complicit in helping protect football players accused of sexual assault. There is a before and an after for every man who has ever thrown 100 mph. Reaching triple digits redefines him forever. A reputation for rarified power becomes his identity. Ken Giles had not merely pitched 100 mph. He was 100 mph. Good equity built by connecting with fans or posting benevolent sentiments is easily razed when the confluence of immaturity, impulsiveness and a false sense of invincibility leads to one regrettable post. It's been only hours since Muhammad Ali's death shocked the world. Inside Gleason's Gym, the hallowed boxing temple in Brooklyn, it still stings like a fresh gash. Persecuted, exiled, nearly assassinated and damned by a world determined to squelch his rebellious rise, Jack Johnson became boxing's first black champion but spent his life battling bigotry. On Tuesday, many Yankees diehards returned on opening day with the scars left from that demoralizing playoff loss. Dallas Keuchel ripped those wounds open when he took the mound again and pitched seven innings in a 5-3 victory. The cheers for Carlos Correa during his electric opening series at Yankee Stadium resonated beyond the ballpark confines. They carried throughout The Bronx, where the country's largest Puerto Rican community has adored him since last season. Lionel Messi has catalyzed a rarefied fervor in Houston, the kind only the best soccer player in the world can inspire. Utah Jazz forward Joe Ingles was stretching on the court before his first game in the NBA when he was suddenly terrified by a disturbing sound: the referee’s whistle. For the past 30 or so years during the final three weeks of December, the restaurant has erupted into Christmas carols during Wednesday, Friday and Saturday dinners, most recently with Michael Pollard playing the concert master. It is a disruption that has charmed droves of loyal diners. Halloween emboldens costumed partiers to embrace false constructs for a night, discarding their identities as well as their inhibitions. They consume more and care less, making them extremely volatile headaches for employees at bars and nightclubs throwing Halloween parties. Justin Verlander had a mantra: You’re not famous until _____. The 32-year-old Detroit Tigers righthander claims he cannot remember his first feat because it “happened pretty quickly.” Still, it is safe to assume that a teenager with a fastball chasing 100mph who frequently filled and replaced that blank with several rarefied accomplishments. Before breaking into Hollywood, comedian Adam Carolla spent 12 years in construction. Now he spends 12 hours a week on his podcast venting about everything from government handouts to specious “service” dogs on airplanes to proper pizza toppings. He approaches everything with an I-can-do-it-better-myself attitude. It drives his most passionate pursuit: restoring Paul Newman’s race cars. He has spent nearly $1 million acquiring and will spend another $1 million rebuilding seven of Newman’s race cars–the largest known collection in the world. For the final boxing match of his life on Saturday night, Todd Velten wanted to savor everything. “I want to pay attention, to hear the crowd and hear the yells,” Velten said before the bout at the WaMu Theater at Madison Square Garden. Velten fought in the 32nd annual Battle of the Badges between New York City's fire and police departments. A swarm of Hollywood agents and managers have descended: The middle men and women have arrived, eroding YouTube’s status as the quintessential do-it-yourself enterprise. In a backstage dressing room, giant, bearded, thick-necked men are getting ready to compete. Once a year, these rugged brutes who can look something like mercenaries compete with tools that can sound something like race cars for the U.S. championship in lumberjacking. As his SUV ventured deeper into the remote northeast corner of India known as Chicken’s Neck, Rodrick Markus noticed his security force multiply. A local guide explained that this was “hard-core” Third World, the sort of place where “at any moment it can erupt into something insane.” More SUVs arrived, and when the convoy finally pulled up to an estate, 40 armed men poured out of the vehicles and led him inside. With his signature all-black ensemble–his suit, shirt and pocket square are always coordinated–and with slicked-back hair, manicured 5 o’clock shadow and Mykita glasses, Markus looked like a nuclear arms dealer. But he was just here for some tea. Some very exotic tea. Part Indiana Jones, part Willy Wonka, the 42-year-old Markus helps America’s best restaurants maintain their reputations for James Beard Award-winning cuisine by importing the world’s rarest ingredients. To kick off Prostate Cancer Awareness Month, Dr. Drew is promoting the cause by sharing his own experience overcoming the disease. How the Giants slugger cut out gluten and bounced back from injury. With the first week of the U.S. Open over, we can already name some champions: the best bites of the tournament. The 26-year-old guard for the Golden State Warriors is arguably the best shooter in the game. For me, a wannabe athlete, receiving a shooting lesson from Curry is like a community theatre actor receiving directions from Daniel Day Lewis. But Curry is so laid back, quick-witted and precise with his advice that he can help even the most hopeless cases put up a perfect shot. The U.S. Open has evolved from a summer sports tradition into a glutton’s paradise. Each year the quality and quantity of food increases, driven by a seemingly competitive spirit to top everything offered in the past and increase the decadence. Johnny Depp blurs the lines between his life and his films. His wardrobe is more befitting of an eccentric character he might play, perhaps a sad-sap vagrant or a struggling grunge guitarist, than the star of the highest grossing films in history. His outfits are clothes that he has self-reportedly worn out over time, with a recent exception: his A.S. 98 boots. Players took batting practice in puffy pirate shirts. A fan reeled in a slice of marble rye bread with a fishing rod from the suite level. George Costanza announced the third inning. And the first 3,000 attendees at the temporarily renamed Vandelay Industries Park received a Keith Hernandez “Magic Loogie” bobblehead. All that and more celebrated “25 years of nothing” on Saturday, when, in honor of the debut of “Seinfeld” a quarter century ago, the Brooklyn Cyclones transformed MCU Park in Coney Island into a one-night shrine to one of New York City’s enduring contributions to television comedy. If all goes according to plan, at the 2014 World Cup opening ceremony in Sao Paolo tomorrow, a paralyzed person will rise from a wheelchair, take several steps, and kick a soccer ball into a goal. The feat will be accomplished thanks to the Walk Again Project, a battery-powered, mind-controlled exoskeleton developed by an international team of scientists. According to the lead scientist on the project, Duke University neuroscientist Miguel Nicolelis, Ph.D., the kick will be a signal to the world that wheelchairs will soon become obsolete. This was DigiFest NYC, part of a booming corner of entertainment where social media stars — people who have created mass followings on YouTube, Instagram and Vine — step out from behind their bedroom webcams. The festival, which rolled into the parking lot at Citi Field in Queens on Saturday afternoon, was headlined by Our2ndLife, or O2L, a group of guys who became famous by videotaping themselves trying to balance cotton balls on their heads and drinking anchovy and hot pepper smoothies. Projected 2014 top draft pick Tyler Kolek is in high school and throws 100 mph. His predecessor and fellow Texan Colt Griffin purportedly became the first high school pitcher to ever reach triple digits in 2001. Griffin threw that pitch, rocketing his reputation and securing a $2.5M bonus in the draft. Six years later, falling far short of expectations, he retired at age 22. "I'm still trying to figure that out," he says, his voice rising to a fever pitch. "It's 13 years later, and it is still just kind of, 'What happened?'" This story appears in ESPN The Magazine's May 12 NFL Draft Issue. 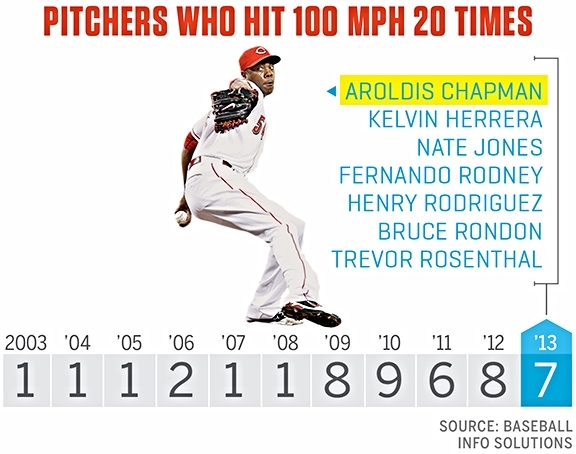 AROLDIS CHAPMAN, HE of the 105 mph heater, might reign as baseball's velocity king, but several other young guns, including Trevor Rosenthal of the Cardinals and Kelvin Herrera of the Royals, are aiming to at least share the crown. Simply put, the 100 mph club isn't nearly as exclusive as it once was because pitchers are now larger, their arms are stronger and their fastballs are faster. As the 2014 NFL Draft began Thursday night, Nick Winkelman sat in front of his TV anxiously waiting to hear the name of one of the players he helped train for the combine. After being chosen 10th overall in 2011, quarterback Blaine Gabbert wrote, "I couldn't have done this without you." Before he was a successful comedian, radio/TV personality, and best-selling author, Adam Carolla dug ditches for a living. He began as a day laborer picking up garbage, sweeping scraps, and stacking dry wall for $7-an-hour. Around the seventh glass of wine, things get hazy. You look down the dinner table at other guests chatting like lifelong friends, their faces illuminated by candles and the moon. 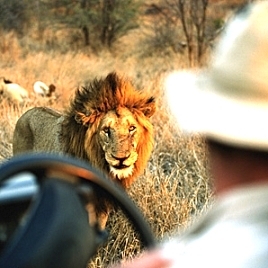 The safari camp feels like it ought to be reserved for Hemingway or European nobility, but there you are. Since the beginning of chefdom, the cluttered, humid, and pungent confines of the world's best kitchens have been populated by a rogue's gallery of misfits and hedonists. And chefs have always been easy to spot thanks to their uniforms, guts, callouses, sugar burns, and – more recently – tattoos. That proliferation of body art is what inspired photographer Daniel Luke Holton and writer Birk O'Halloran to create Eat Ink, a cookbook focusing on tattoos. "Usually it's like drinking a pasta sauce, you know?" Lior Lev Sercarz, author of The Art of Blending, says of a typical Bloody Mary. "It's very thick; it's very chunky. There's tons of stuff left on the bottom of your glass. And usually, when this thing comes to your table, it looks like a salad bar." "I'm on my last concussion," says University of Cincinnati senior Nick Furney, who competes with what can only be described as a dangerous intensity. "I have a really bad habit of catching girls with my face." Furney is a male cheerleader. When University of Kentucky basketball coach John Calipari watches his players practice, he doesn't have to wonder who's working hard and who isn't. Thanks to the heart monitors he has each player strap around his chest, Calipari knows for sure. Seth Davis has covered basketball for the last 20 years. His obsession with sports and writing – "In my heart, in my soul, I am a writer" – has made him something of an expert on his own competition: journalists who write about basketball. C.C. Sabathia strolled into this spring training looking thin ner, inspiring another wave of headlines about his dramatic weight loss. After three offseasons of gradual alterations to his training and eating habits, Sabathia had finally fully transformed his formerly hefty load of fat into lean muscle. The ultimate weapon in any tennis player's arsenal is an accurate, high-velocity serve. Long a mainstay of men's tennis, rocketing serves have been the foundation Venus Williams' dominance over the last decade. Here's what Venus recommends. It will be bittersweet for Eli Manning when his brother Peyton takes the field on Sunday for the Super Bowl. The field is, after all, MetLife Stadium, where Eli's New York Giants spent a long season trying and failing to get their offense going. But brotherhood is brotherhood and the youngest member of the Manning clan is feeling good. "Seattle's defense has been good, but the Broncos probably have the best offense in the NFL." Shannon Scott said he and his fellow Ohio State guard Aaron Craft share something of a sixth sense, what he calls a “turnover sense.” When one of them harasses an opponent, the other can sense the turnover coming and even take off to jump-start a transition basket. Defensively, Craft and Shannon are considered the nation’s best backcourt, and they displayed that in No. 3 Ohio State’s 64-61 victory against Notre Dame at Madison Square Garden on Saturday. If the New York Giants can pull off wins against the Chargers, Seahawks, and Ravens over the coming weeks, Justin Tuck will make it to Christmas without ever having had a losing season. After the Giant's humiliating 0–6 start to the season, it's remarkable that there is even a snowball's chance in hell of Tuck's record remaining intact. But the All-Pro Defensive End doesn't believe there was eve r any reason to believe his team would melt in the face of adversity. When the Heat play the Cavaliers on Wednesday night, James Blair and Josh Raggi won't merely be cheering. They will be promoting their "Come Home LeBron" campaign, a quixotic grass-roots effort to bring James back to his original, hometown NBA team. Last season, when the Heat visited in March, Blair, a 22-year-old physical-therapy student at Kent State-Ashtabula, stormed the court and approached James wearing a T-shirt that said "We Miss You." He was arrested, jailed 23 hours for trespassing and banned for life from Quicken Loans Arena. Gonzalez relishes the off-season, when he gets out of the therapeutic tub and onto the water. He spends the winter months fishing off Haulover Beach Park, a spot he calls "the backdoor to Miami." The 28-year-old lefty grew up nearby in Hialeah and stumbled into this love affair. He was six when he and his brother strolled into a Kmart, became interested in a display of fishing rods and demanded the store's owner teach them how they work. The Ski Marathon in Switzerland's Engadin Valley, a plush Alps playground four and a half hours by train from Zurich, attracts more than 12,000 skiers annually with its storybook scenery. But the start is "like running with the bulls," says Matt Liebsch, an American Olympic hopeful. Skiers have to navigate "Mattress Hill," a downhill plunge through tight-knit trees wrapped in mattresses, which skiers bounce off like pinballs. PETERSBURG, Va. -- It was here, out in the sticks of southern Virginia, on a drag strip covered with dirt on which man tempted beast at the Great Bull Run -- the first event of its kind held on American soil -- that I learned the consequences of insatiable bloodlust. Bartender Trace Conway of New York's The Red Cat created a cranberry-based drink that didn't taste like juice or put the drinker on the floor. "I was trying to think of how to add a cranberry flavor without being too tart and still add the sweetness and get a nice flavor out of it," she explained. Her solution? Cranberry jam. Chef Randall Cronwell, an instructor known as "the sausage guru" at the Oregon Culinary Institute, has devoted his life to perfecting the traditional art of making links. He has also pioneered new ways to advance the art and science of sausage making. Chef Dean Fearing fondly recalls the giant portions served at his family's Thanksgiving meals in eastern Kentucky during his childhood. He says it took his grandmother three days "with a bun on her head and a little, frilly apron, cooking off of a GE four-burner gas stove" to prepare her massive menu of homemade Southern treats. Hulu's new original 10-episode series, 'Behind the Mask,' premiering October 29, takes a look at men underneath the comically oversize heads and reveals the passion, pride, and sometimes pain that motivates them. Cooking with spices is an art form. Used well, they will elevate the humblest of ingredients to something sublime. "It bothers me how people say, 'Oh, I don't use spices or I don't like spices or I don't like spicy food,' " says Lior Lev Sercarz, author of 'The Art of Blending.' "But I think that all just comes from a lack of knowledge." 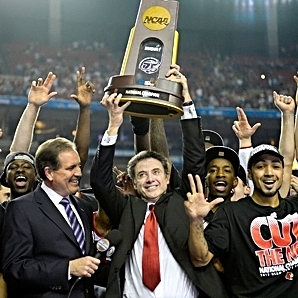 After winning a title and being inducted into the Hall of Fame this year, Louisville coach Rick Pitino doesn't have much left to prove. As he enters his 40th season of coaching, he credits his success to one simple fact: He knows how to spot talent. Arnold Schwarzenegger was famous before the movies, politics and scandal, but who wants to talk about today's glistening, erect-nippled behemoths? Vlad Yudin, whose documentary 'Generation Iron' seeks to reposition bodybuilding as an elite sport. The men Yudin follows in the lead-up to the 2012 Mr. Olympia competition engage in a hell-bent race toward the ideal build, ultimately revealing the fundamental masochism of their lifestyle. In 'Hell Week,' a documentary about the first week of football training at Station Camp High School in Gallatin, Tenn., a linebacker neatly sums up the personal effects of enduring this national ritual. After an intense, sun-scorched day packed with vomit-inducing drills over multiple practices, the exhausted player observes: "I smell like pee mixed with sweat." It's just one of many striking sound bites in the film that will evoke a sense of bittersweet nostalgia. "Playing in the 'Mistake By The Lake' – that big, old, crusty building, where half of the field was dirt – it was what football was meant to be," Boomer Esiason says. "It was meant to be played in mud, dirt and lousy weather in front of 85,000 lunatics." After a rainy Labor Day at the U.S. Open prevented hundreds of fans from attending matches they had paid to see, the eighth-seeded Richard Gasquet and the 10th-seeded Milos Raonic treated a bottled-up and full-throated crowd on Court 17 to 4 hours 40 minutes of thrilling tennis deep into the night — with Gasquet the victor. For the first time ever, two NFL regular-season games are being played in London's Wembley Stadium. The Discovery Channel filmed 'NFL in Season,' an hour-long all-access look at what goes into exporting a national obsession. Heavy rain at the United States Open on Monday left hundreds of fans upset after a delay of four and a half hours led to match relocations and cancelations . With about 30 people waiting in front of him, Stephan Ferranti had arrived with his wife at noon. They had yet to see a match. His wife purchased a hat during the rain delay. “I’m sorry they got more of my money,” Ferranti said. "My alarm goes off every day at 4 o'clock," says Mike Greenberg, who joined ESPN in 1996. "People always ask me if you get used to it. And the answer to that is, no." Mike Golic, who played eight seasons in the NFL, shares his partner's agony. Few recognize that Simona Halep entered the United States Open on the hottest run of any player. Her emergence has been sneaky and sudden, just like the other Romanian women on the tour. “I am overwhelmed that women’s tennis is so strong on the Romanian side today,” said Virginia Ruzici, who manages Halep and is considered the best women’s player from Romania. This time it's different. How did the Pirates finally - well, probably - break the cycle of doom? THE DAY IT began to unravel, Aug. 7, 2012, the Pirates stood in second place, a 62-46 record, with the franchise's first playoff berth in nearly two decades more or less assured. Even late in the game, Pittsburgh looked indomitable: Jason Grilli, then baseball's best setup man entered in the eighth with a 4-3 lead. But then Grilli gave up four runs, his replacements gave up three more, and the Pirates seemed to lose more than the 10-4 contest to the .500 D-backs. Pittsburgh lost 37 of its final 54 games and finished the year 79-83 -- a 20th consecutive losing season, a North American professional sports record. It was, owner Bob Nutting says, "an epic disappointment and collapse." Håvard Ruglan is the first professional prospect to have reached the NFL exclusively via social media, without ever previously playing any organized football. His four-minute YouTube highlight reel, "Kickalicious," shows the left-footed kicker punts footballs to people in passing cars, swishes one through a basketball hoop and – most spectacularly – kicks one up about 30 yards and then punts a second ball so it collides with the first one in midair. Ivan Nova is channeling his spirit animal. “I have to be a león,” he is telling himself these days. Be a lion. He says this to jump-start himself before a game, to sharpen the movement on his recently devastating sinking fastball or to shake off a mistake pitch when he has the next batter to attack. Since being removed as a starter in late April, he has pitched 271/3 innings with a 2.63 E.R.A. in three relief appearances and two starts. On a day when the Yankees scored two runs in the bottom of the ninth to steal a 3-2 victory from the Orioles, they received significant and potentially positive news involving Derek Jeter, who is recovering from a twice-fractured left ankle. The Yankees announced that Jeter will begin his long-awaited minor league rehabilitation assignment Saturday night. For a guy who earns his paycheck doing physical labor, Gio Gonzalez spends a lot of time sitting around waiting. The left-handed starting pitcher for the Washington Nationals works hard on game day to shake off the idleness that can overtake hurlers between starts by following a set and stringent program that prepares both his muscles and mind to lead the Nats when he's asked to take the mound. To make it to the majors, a player must advance five or six rungs through the minors, outplaying any number of other draft picks along the way. One of the many players left on the discard heap was Michael Moras. His distance from the major leagues is now measured by how far he sits from his television, watching broadcasts of Mets games. Before the season, Jon Niese stood out as a model of consistency and the logical choice as the Mets ace. But after another dreadful performance, in the Mets’ 11-2 loss to the Pittsburgh Pirates on Saturday at Citi Field, Niese will have to regain his reputation for dependability. Lyle Overbay laughed when he was compared with Derek Jeter. The notion that he — a 36-year-old first baseman long removed from his best years — could fill the void left by Jeter made him giggle. But having won five of their last six games, the Yankees have, at least for now, a new so-called core four with Overbay, Travis Hafner, Vernon Wells and Kevin Youkilis that is producing runs, changing expectations and providing the kind of everyday veteran leadership that has become a staple of the club.